Grimes Point Archaeological Site is a field of basalt boulders today, but during the Pleistocene, it was the marshlands of Lake Lahotan. It is believed that what is now called Grimes Point was first visited by Native Americans about 8,000 years ago due to the abundance of wildlife that flourished around the lake. The petroglyphs were likely carved over thousands of years as people hunted and gathered in the receding Lake Lahotan’s ecosystem. 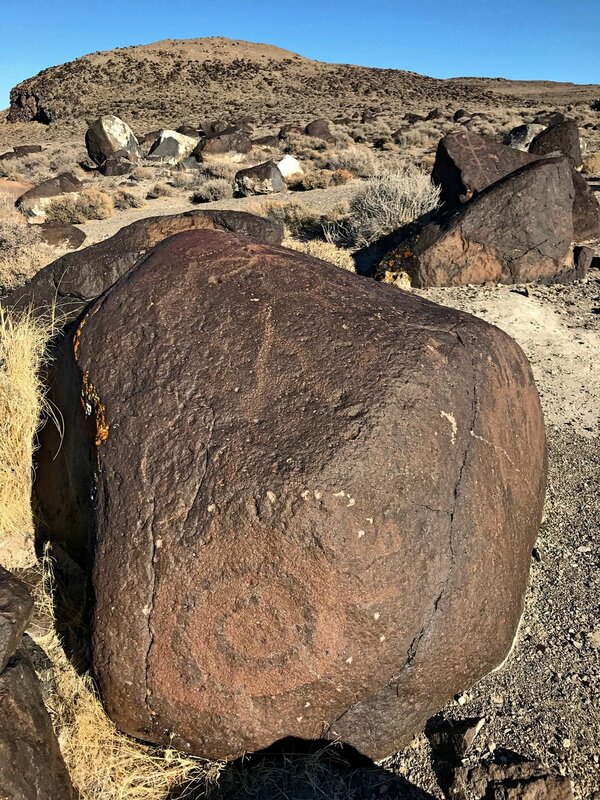 The petroglyphs at Grimes point are some of the oldest in Nevada. The designs that are pecked into the desert varnish of the boulders are mostly abstract, yet they are still very striking. Some were squiggles and spirals, and there were many deeply pitted “cupules”—the oldest type of petroglyph at the site. There are some representations of people and animals left behind in the rocks as well. The oldest petroglyphs at the site are these round pits, called cupules. The older petroglyphs have wider lines and they have been partially regained their patina, like the spiral near the bottom of this rock. Newer petroglyphs are lighter in color and the designs are more complex. 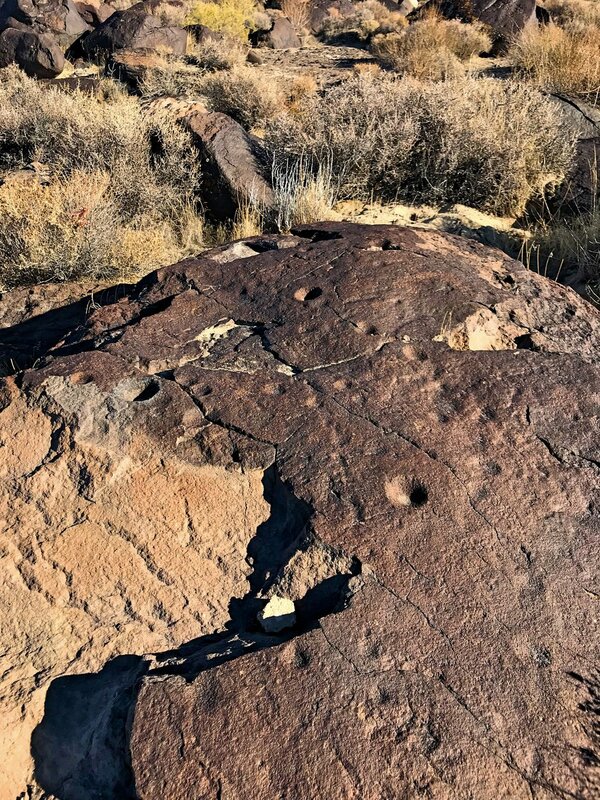 Besides the ¼ mile interpretive trail that leads you around the petroglyphs, there is a two-mile-round trip trail that overlooks the surrounding basin. While the basin’s salt flats are beautiful, from this height you can see how Grimes Point was misused before being added to and protected by the National Register of Historic Places. The ground surrounding the boulder field sparkles with broken glass, because the site was once used as a dump. Only 20 minutes from Grimes Point is Sand Mountain, a two-mile-long, 600-foot tall sand dune. Unlike other sand dunes, Sand Mountain stands alone in the middle of the desert not surrounded by other dunes. The sand originates from ancient Lake Lahotan. The six story sand dune is one of the few singing sand dunes in the world. On windy days as the sand blows across the top of the dune it will produce eerie humming sounds. The area is extremely popular with OHV enthusiasts, so it seems a little unlikely that you would actually be able to hear the singing sand over the roar of their engines as they rip around the mountain’s snaking spine. Although there are apparently areas closed to motor vehicles to protect an endangered butterfly, Ian and I just decided to appreciate the dune from a distance and avoid the weekend’s massive OHV crowd. Free camping nearby: We didn’t camp super close to either Grimes Point or Sand Mountain, but our campsite the night before and the night after were both only about an hour from Fallon. The first is a BLM camping site near Dayton, Nevada. The rabbitbrush was in full bloom when we were visiting and that made this site really pretty, but it also had a lot of garbage. Our campsite included a smashed up toilet and so many shot gun shells that it was like confetti. The second site we would recommend a lot more. It’s an abandoned RV campground on Tamarack Beach of Walker Lake, so there are level concrete pads to park on. We parked here in the dark and waking up to a shimmering lake in the middle of the desert was really amazing. The free camping spot on BLM land near Dayton, Nevada. Waking up to a gorgeous lake ringed by mountains in the middle of the Nevada desert was incredible.